In my post about the Big Purple Party I mentioned how we had worked on a short programme of music for the entertainment. We had actually planned to have one more particularly special musical piece performed but unfortunately it couldn't be played because the piano at the birthday venue wasn't in the best condition. James (18) had written a special piano piece for his Auntie Anna's birthday, and titled it simply 'Anna'. We had asked if there was a piano at the venue and were told that there was one there that had recently been tuned. 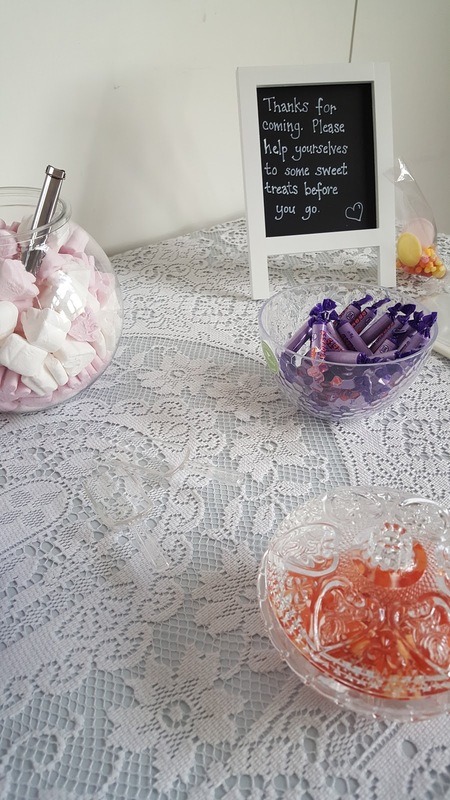 Unfortunately, when we arrived on the day of the party we discovered that although the piano may have been tuned recently, there had been no mention made of the fact that the majority of the keys stuck down when you played them! I'm not sure how it could possibly have been tuned without the tuner realising this, but there was no way it could have been performed on and it was too late for us to make an alternative arrangement for someone to bring a digital piano along to the party. Instead we just told Anna that James had written a piece for her and that he would record it as soon as possible so that she could hear it. In a way I'm actually kind of glad that he didn't get to play it on the day. For the simple reason that I think it's such a beautiful, emotional piece and I fear that there may have been few dry eyes at the party had he been able to play it there, especially given Anna's illness. 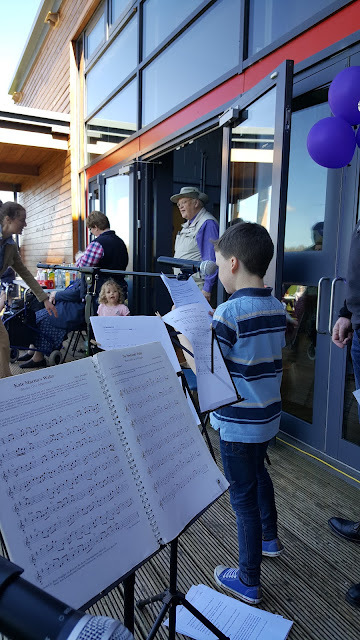 True to his word, he managed to get a decent recording of himself playing the piece the following week and uploaded it to his Soundcloud page for Anna to hear and to share with others. Anna is a big fan of hill walking and so James chose one of her many hill walking photos to be the background picture for the track. 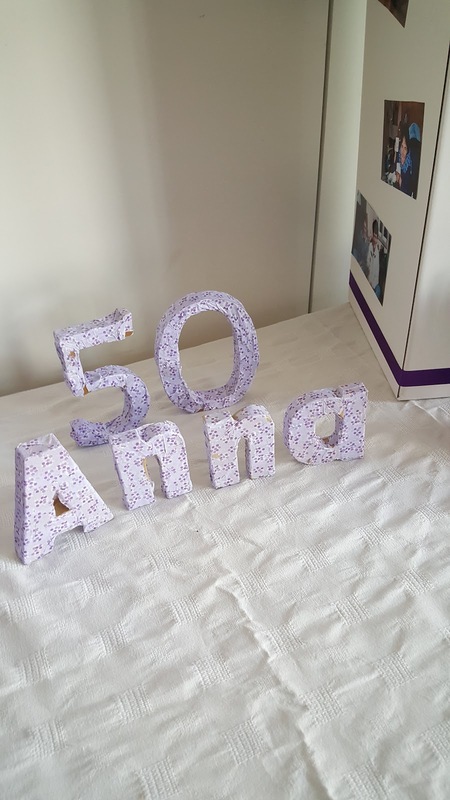 So, without any more chat, here is the special birthday present James gave his Auntie for her 50th birthday. I reckon he's still on track for a good career as a composer. Recipe of the Week seems to have fallen by the wayside a bit in recent months, and as a result I've got a pile of recipes to share building up in my notebook. It seems fitting that we should get Recipe of the Week up and running again with something suitably chocolatey and decadent sounding. Muffins are a great weekday treat. 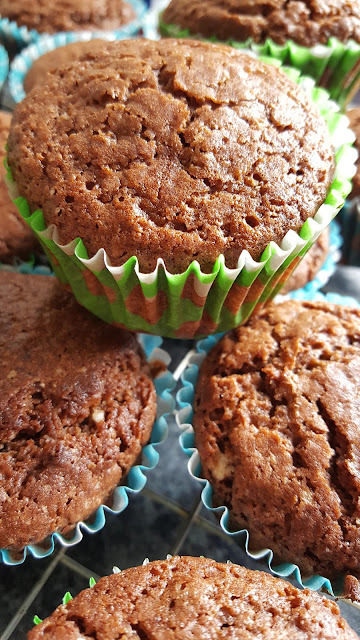 They are so quick and easy to make up and a homemade muffin tastes far superior to a shop bought one. Not only that but they are so much cheaper to make than to buy - especially if you are making them free from! The secret to making muffins is not to over mix the mixture. Just stir the wet and dry ingredients together enough to mix all the dry stuff in. It doesn't matter if the mixture is still lumpy. Over mixing will give you a heavier, chewier muffin. 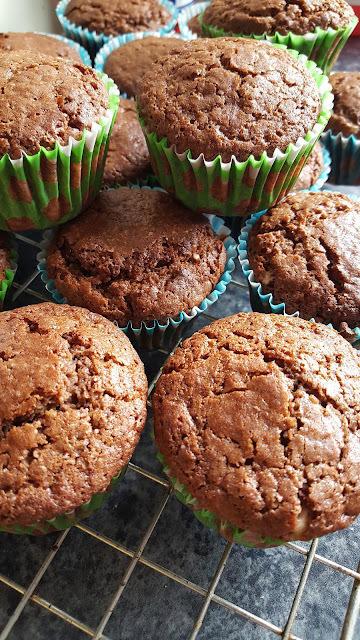 I've also found that when baking anything chocolate and gluten free it is better to use drinking chocolate rather than cocoa, as cocoa will dry out the cake much more. Obviously be sure to check that the drinking chocolate is a dairy free one if you are baking dairy free too. I use either Cadbury's Drinking Chocolate or Sainsbury's own brand Drinking Chocolate and both are gluten and dairy free. Make sure that you don't use an instant hot chocolate powder instead as these will contain dried milk. 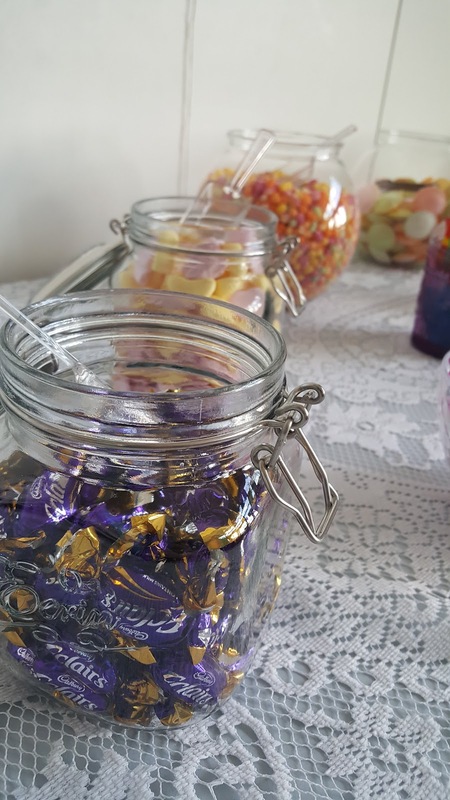 You could substitute dairy free white chocolate buttons for the chopped dairy free white chocolate in these, but the boys prefer the larger chunks that you get when chopping a chocolate bar. 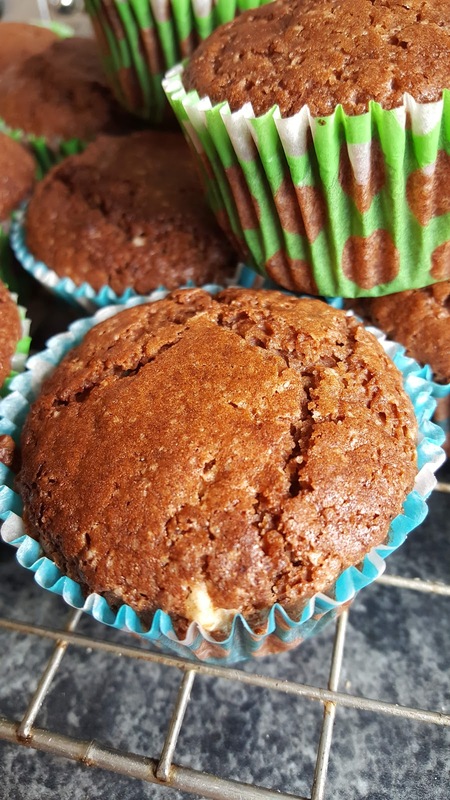 These muffins are amazing when warm from the oven. This recipe will make around 16 muffins. - Preheat the oven to 200C and line two muffin tins with about 16 muffin cases. - Mix all of the dry ingredients together in a bowl. 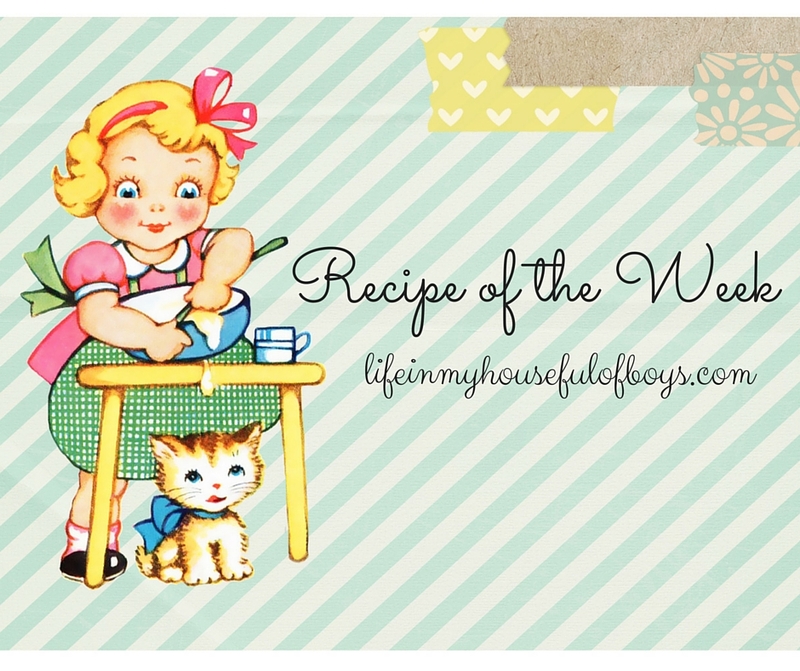 - Mix all of the wet ingredients together in another bowl. 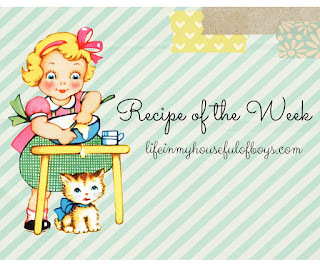 - Add the wet ingredients to the dry ingredients and mix together until all combined, remembering not to over mix. - Spoon into the muffin cases until they are about 3/4 full. - Bake for about 20 minutes until they are firm on top. It's been far too long since I posted here, and I fully intend to get back into the swing of regular blogging again. I have so many things I want to get on here but I didn't want to post them without writing this post first. But I kept putting off writing it. 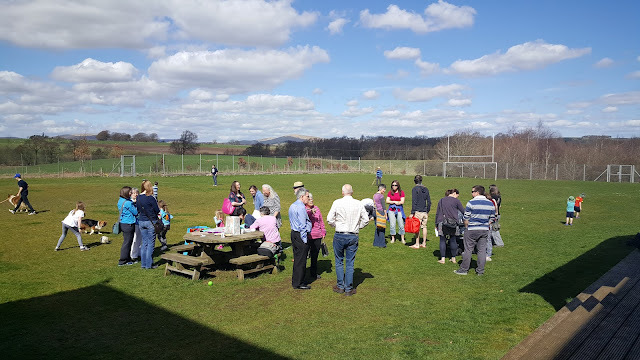 You see, despite the mostly celebratory nature of the party I'm writing about, it was tinged with a large amount of heartache, and I suppose I just didn't feel like I could get the words right for the post. Maybe in some sort of way there was even a hint of denial there. A sort of unwillingness to put things down into print as it would mean accepting the reality of the situation. Or maybe it's just because things have just been so busy. Who knows. 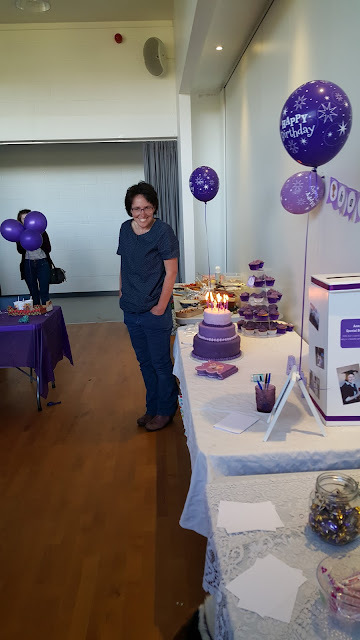 The Big Purple Party was for my husband's sister, who turned 50 last month. She had been super organised and had booked the location and the caterers to provide a barbecue before Christmas, and had asked us if I would bake a cake and if we would provide some musical entertainment. We also took charge of the decorations and of making a memories scrapbook. So far, all so celebratory. 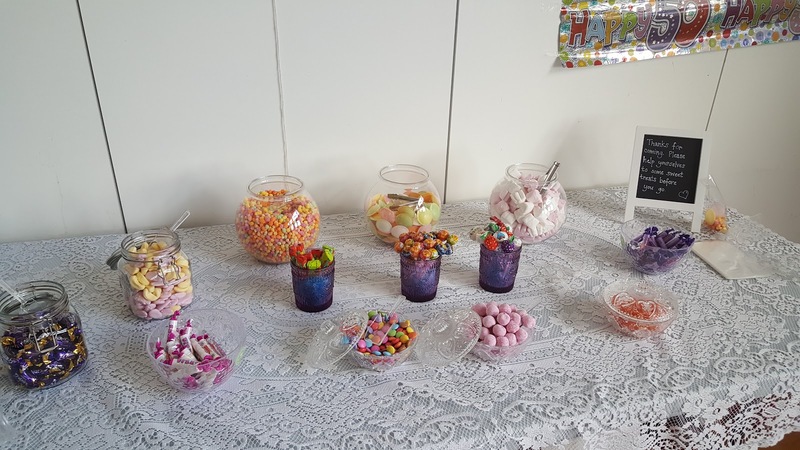 About 6 weeks before the party was due to take place, at the very end of February, my husband received a phone call from his sister. She told him that she had just been diagnosed with Pancreatic Cancer. This was such a shock for us all as we had no idea she had been experiencing any symptoms at all, albeit very vague ones. But she had been aware that something wasn't quite right since around November time, I think. Further tests revealed that the tumour was of such a size that it wouldn't be operable, as well as the discovery of a secondary. 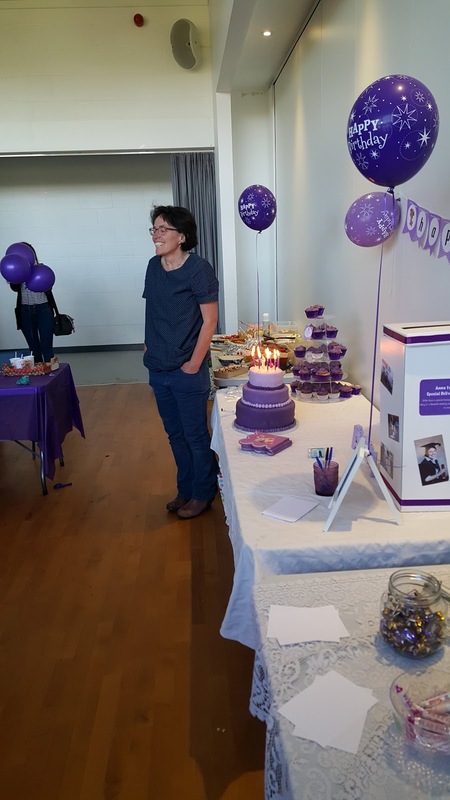 Treatment options were discussed and it was agreed with her medical team that she could hold off starting chemotherapy for a couple more weeks so that she would be well enough to attend her party. My sister in law isn't married, and has no children of her own, but is very close to our boys, especially to Calum (15) who she took to dog agility with her and her dogs every week. He has accompanied her on numerous hill walks, and sometimes David (12) would tag along on these too. Latterly she had been taking David to dog agility too to help with her younger dog. 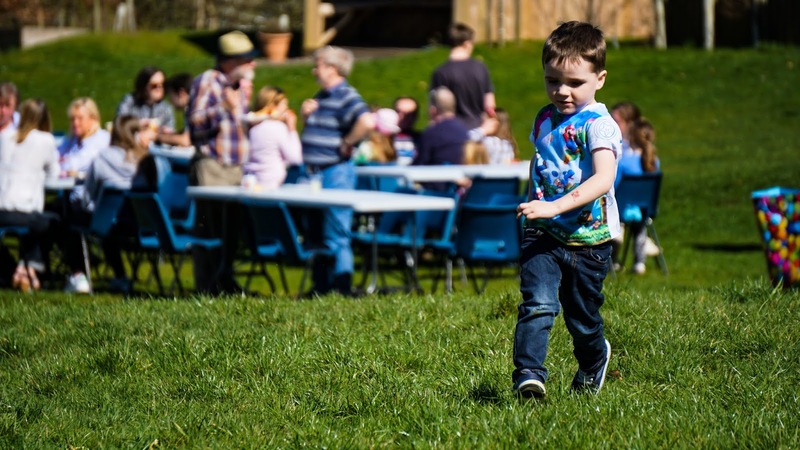 We wanted to be sure that from the very beginning the boys knew more than just that their Auntie was 'unwell'. The older boys know that she has cancer and that it isn't curable. Even 8 year old Ally seems to have some sort of understanding of this. I have no idea how much little Fraser is able to understand of what is going on. 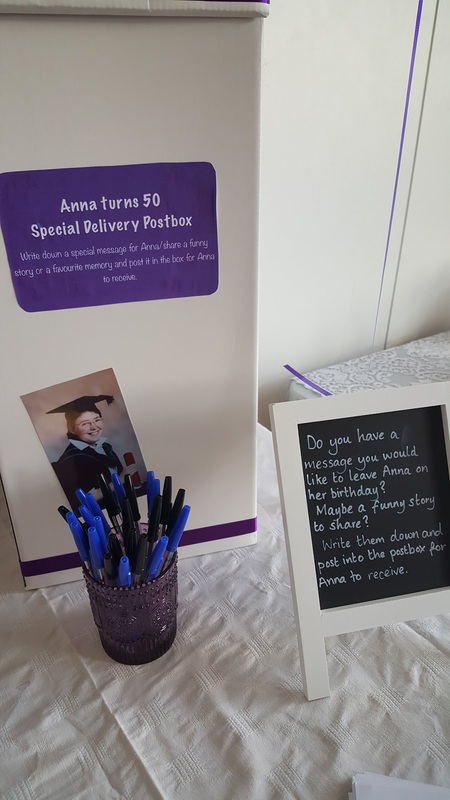 So with regards to the birthday party we were even more determined to make it a really special one, so that we could show Auntie Anna how much she really means to everybody. One of the first things we organised for the party was a sweetie buffet. Everything for this was from the Poundshop. 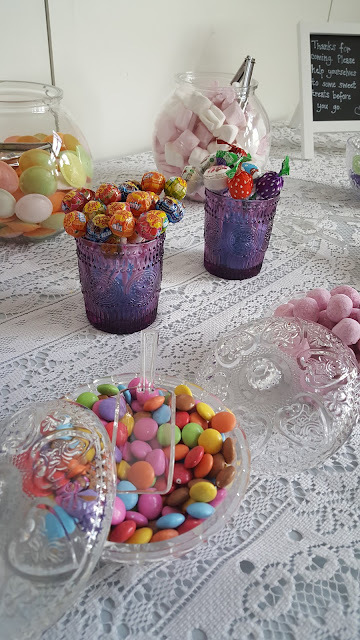 Even those lovely crystal looking dishes! 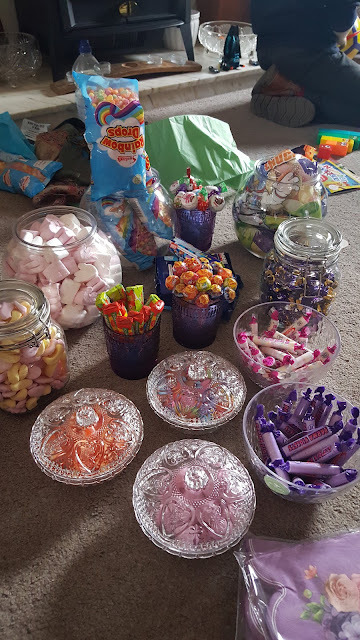 I bought all this a few days before the party and everybody was under strict instructions not to sample anything. Oh, the temptation! Choosing the theme and colour scheme for the party was easy. 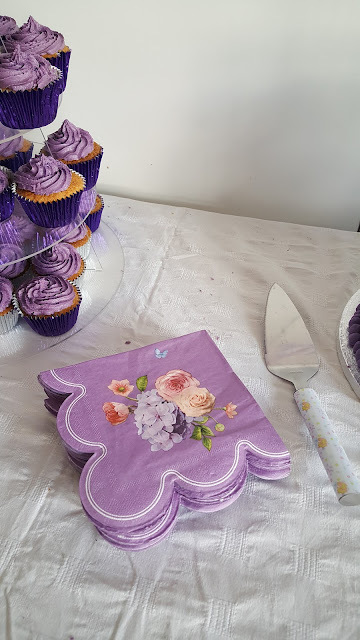 Everybody who knows my sister in law knows of her huge love of all things purple. So much so that she will almost always be wearing something purple. 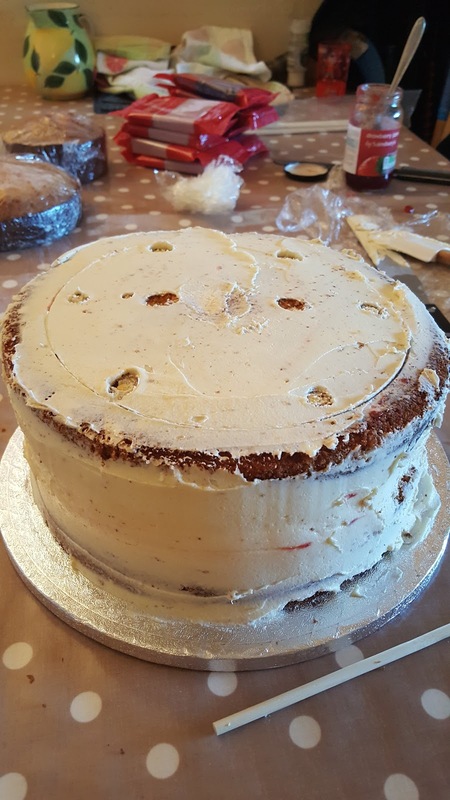 My brief for the cake was simply that it had to be big enough to feed between 50 and 80 people. 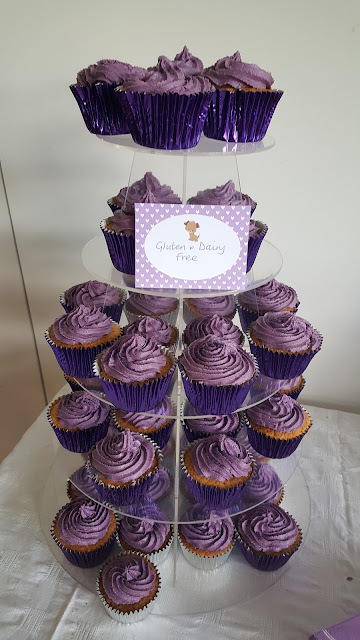 Since it had to be so big I decided against making the cake free from and instead made up a big batch of gluten and dairy free cupcakes for those with allergies. 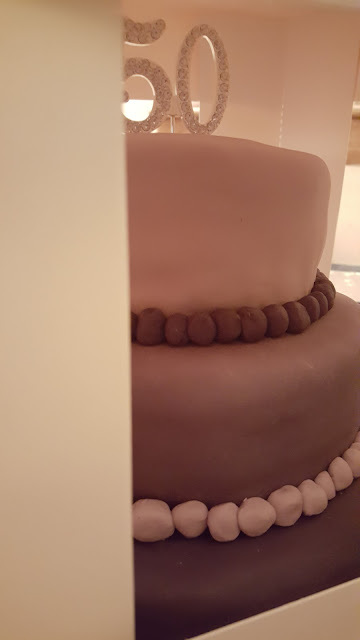 I planned to stack them up on a 5 tier cake stand next to the main cake. The cupcakes were baked in purple foil cases, topped with a swirl of purple icing and finished with a wee sprinkle of edible purpler glitter. 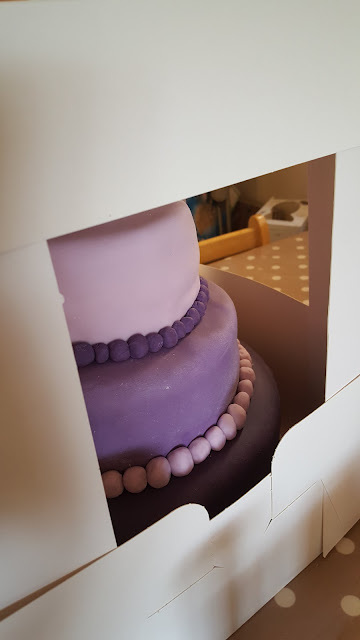 Too much purple? Not for Auntie Anna! 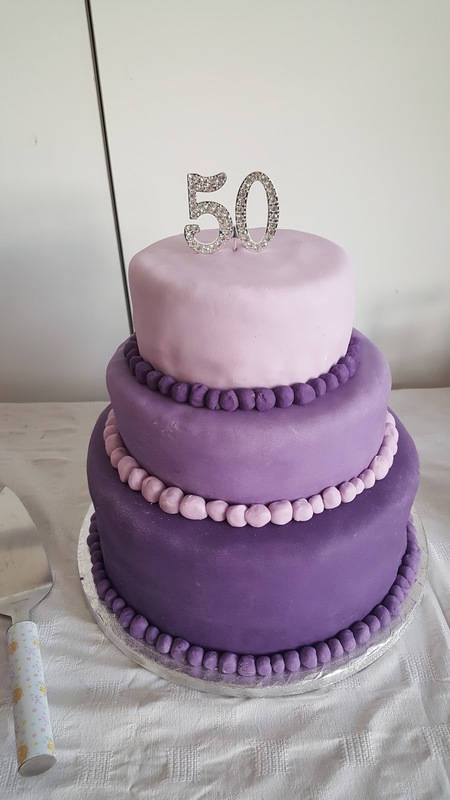 I baked all the cupcakes and the three tiers of the cake two days before the party so that on the day before the party I could focus my attention on the decor. Decorating the cupcakes was simple enough, but decorating a three tier cake was a little more daunting! 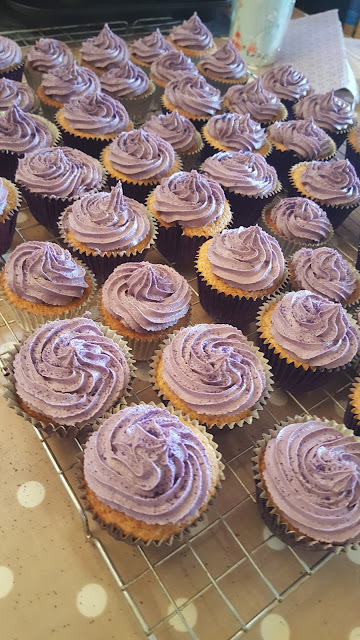 I made a HUGE quantity of butter icing and set about construction. Since I was so scared of the cake collapsing, having seen so many spectacular sinking cakes on tv baking shows, I made sure to put plenty of dowelling rods in the bottom and middle cakes. Getting that bottom cake covered with fondant icing was a relief as I hadn't ever added fondant icing to a cake of that size before and was convinced the icing would tear when I lifted up such a big amount! 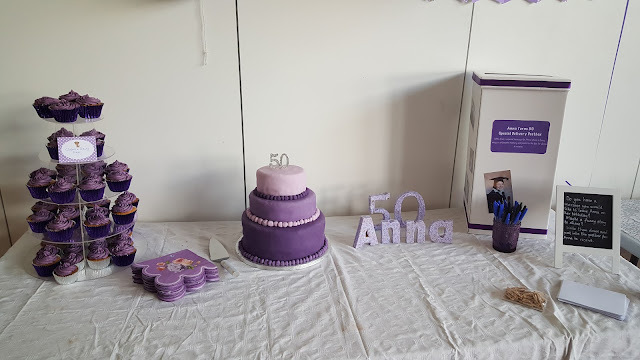 I wanted the cake to be fairly simple as Anna isn't a fancy, fussy type. 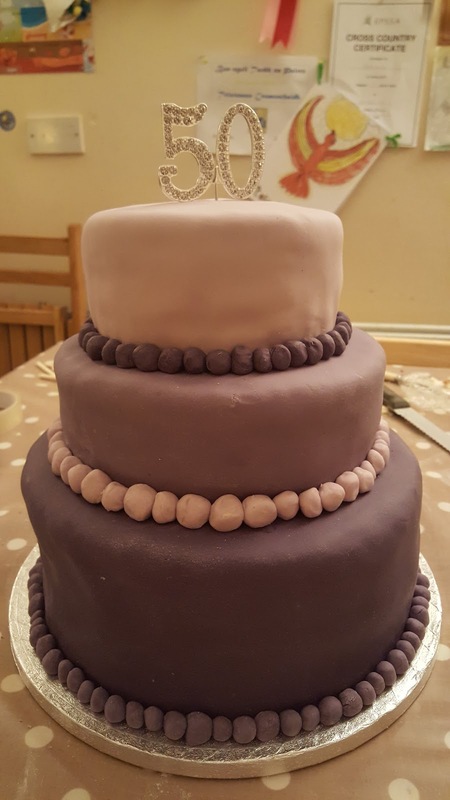 Originally I planned to put ribbon round the bottom of each layer but it didn't sit quite right and looked a bit scruffy, so I chose to put some balls all the way round the bottom of each tier instead. The lighting in this photo isn't great as it was late at night when I finished the decorating, but you can just about make out that each tier is a different shade of purple. 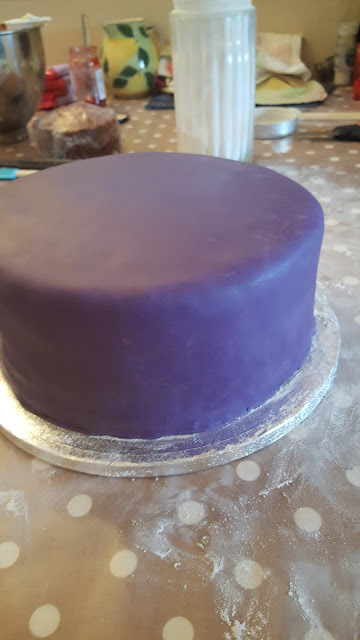 The icing isn't exactly professionally smooth, but I was incredibly pleased with how it turned out. Once I tucked it away in it's box for the night I was plagued with doubts as to whether I should have put all three tiers together the night before just in case it collapsed over night. As each half hour of the evening progressed and it was still standing tall every time I peeked in the box, I relaxed a little bit more. But our work for the evening wasn't finished there. I say 'our' because although the cake was my work, the boys all helped with other parts of the party prep. Calum helped me stick old photos of Auntie Anna in a scrapbook that we planned to have lying out at the party. 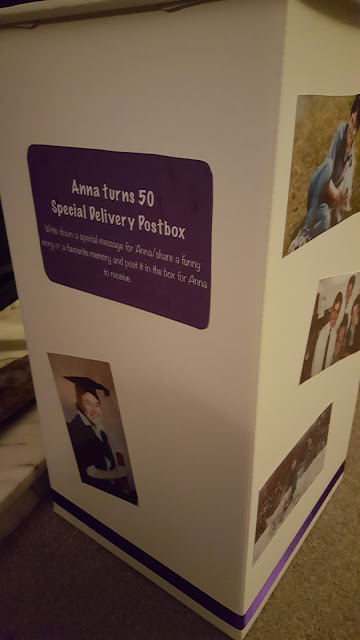 We also made up a postbox for people to post their favourite or funniest stories of Anna into. After the party she could then stick them into the back of her scrapbook. We stuck a couple more old photos on the outside of this too. By 1am I had finally ticked everything off my to-do list for that day. 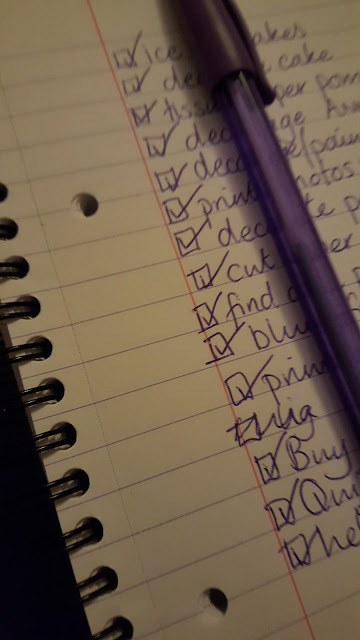 The fact that I wrote it all in purple pen has just struck me just now and was entirely a coincidence! What a relief the following morning when I came downstairs to see the cake still standing tall! However, the party destination was still a 45 minute drive away and so we still had to transport it safely there. 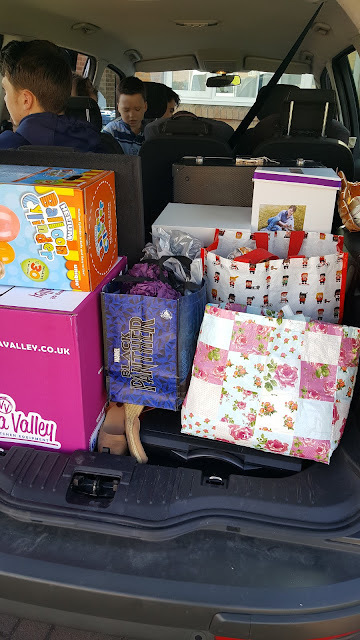 It was wedged into the back of the car, surrounded by all our other party stuff and musical instruments, and Calum was charged with making sure it didn't shift on the twisty country roads we had to travel. 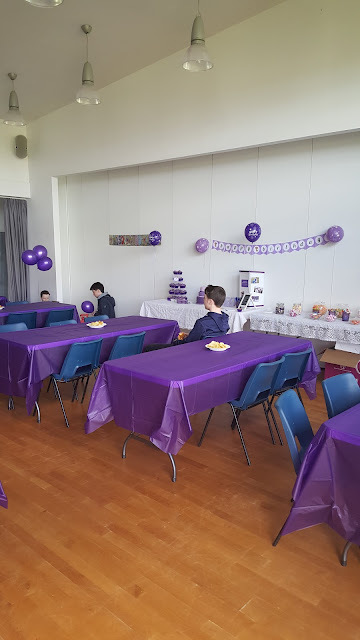 We got the to destination nice and early, with plenty time to get the cakes set out, the sweetie bar laid out and lots of purple balloons blown up. Ally and Fraser (4) both decoupaged these numbers and letters for Anna. I let them do it all themselves so that it really was authentically done by them. 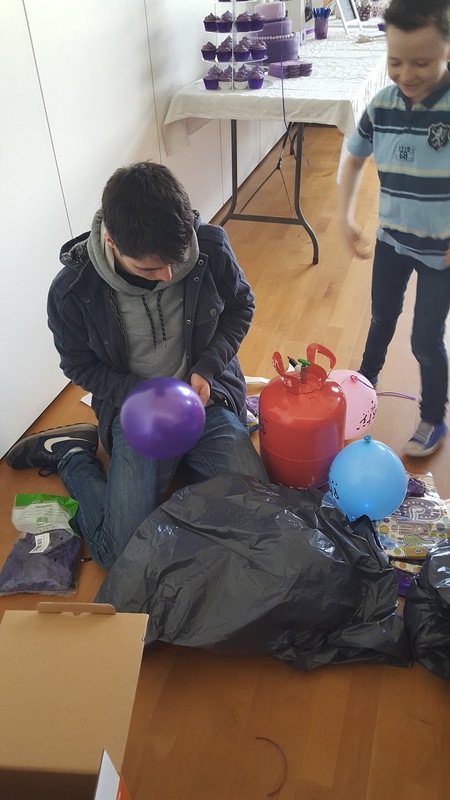 James (18) was in charge of blowing up the helium balloons and I think we only lost three or four of them by them slipping out of his hand and up to the roof! 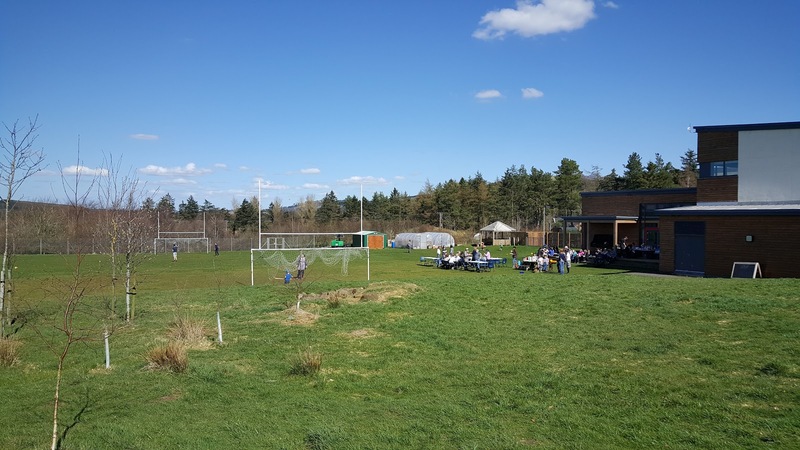 It was the warmest, sunniest day there had been all Spring. The location was perfect too. There were a lot of families invited and there was plenty of safe, secure space for the children to run around in and do their own thing while the adults mingled. We had worked out a wee half hour programme of Scottish music for some entertainment. Some pieces were played as solos by Calum on his accordion. In others he was joined my my husband on his guitar and me on the flute. I'm pretty sure that Calum's solos were the most popular ones though, and he played them so well too. 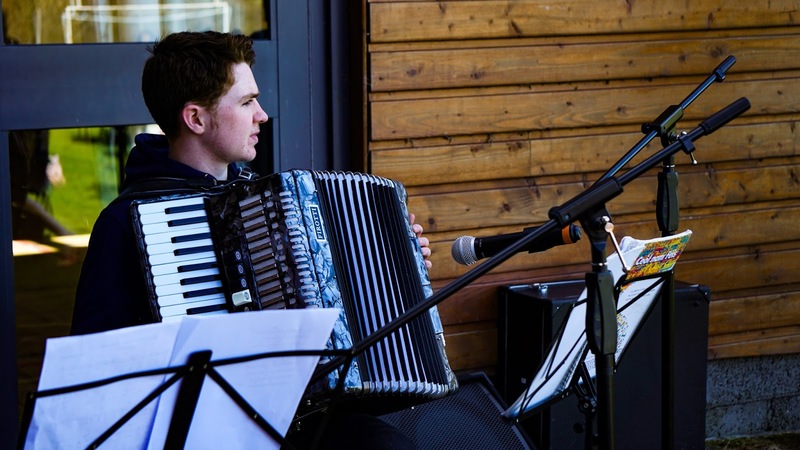 He played some of the old favourites that everyone loves, like the Dark Island and Kate Martin's Waltz. James' girlfriend came down from Lewis to join us for the party, and she was the 'official' photographer. She took lots of great pictures of all the guests, but here are a couple of my favourites. 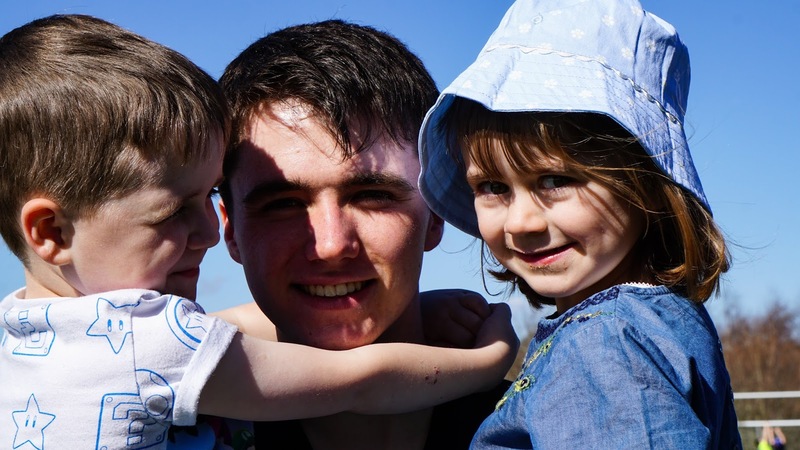 This is James with his youngest brother and his youngest cousin, my brother's daughter. Ally did the introduction of the musical items for us. He was very sweet. He has only just started doing English reading, after three and a bit years of only Gaelic reading, and so he practised it really hard. Anna mentioned to us the day before the party that actually there may be up to 100 guests there. 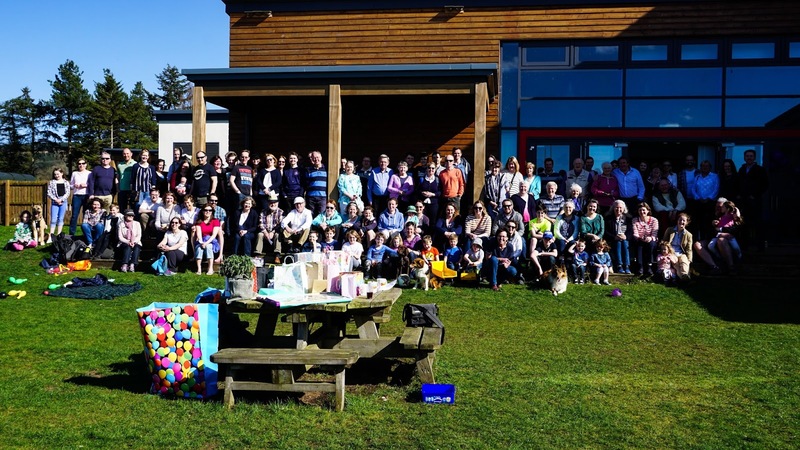 It didn't feel like what I imagined 100 guests would feel like as the location was so good and everyone was able to spread out, but the quick head count I did of the group photo says there were 97 people there including babies and children. The final part of the party was singing Happy Birthday and the cake cutting. 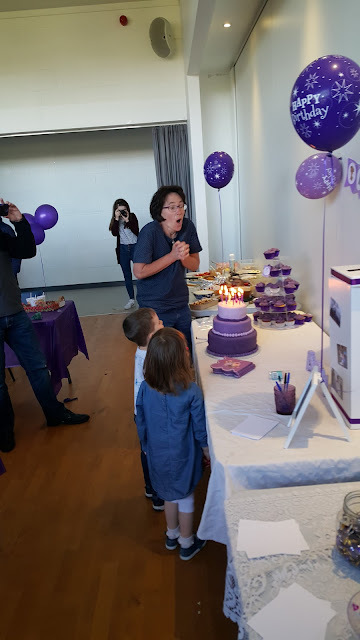 Anna asked if any of the children would like to help her blow out the candles and so Fraser and his cousin Joanna were only too keen to help her out. Everyone who was at the party agreed about what a special day it was. Auntie Anna was delighted with how well everything went, and we were all so happy that everything had gone so well. Even better than we had hoped it would. 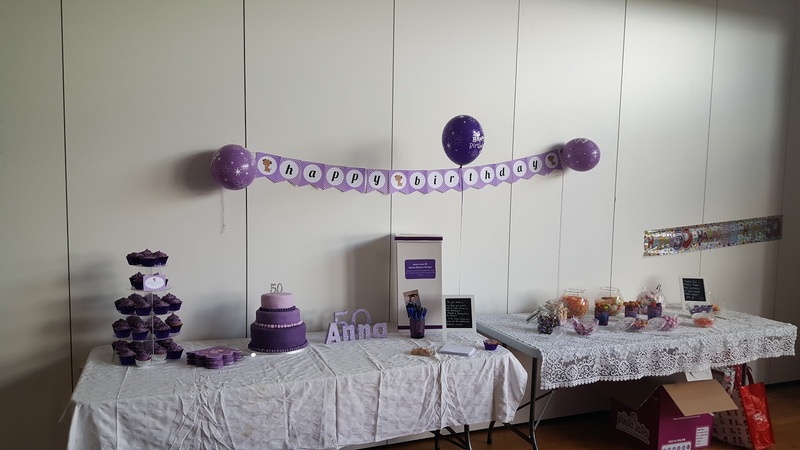 Anna started her chemotherapy a couple of days after the party. 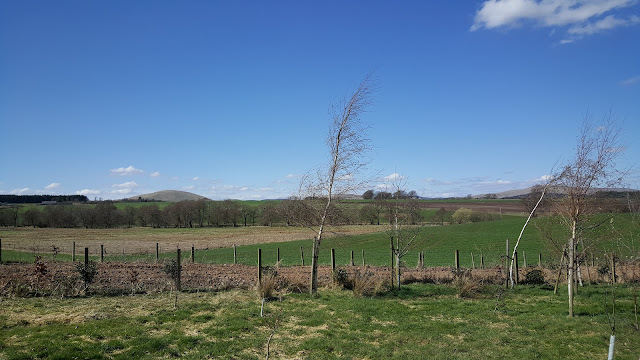 It's been a hard few weeks for her, for her parents, and for Andy, my husband, who has been working himself to the bone trying to support them all through this as well as maintaining all his work commitments. It feels incredibly selfish of me to say that it has been difficult for me too, as I know it is nowhere near as difficult as it has been for them. But it has been an exhausting few weeks where I have barely seen my husband, and so I have been doing my best to keep everything running smoothly at our end. We would very much value your prayers for the coming weeks and months, especially for Auntie Anna as she walks this horrible journey.